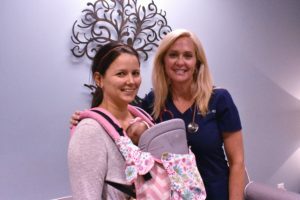 Sabrina Tavares and her husband chose Lincoln Medical Center for the birth of their third child because they desired birthing options that were not available in their current city of Huntsville. Sabrina specifically knew she wanted a water labor because this was something she experienced with her first child, Calvin, who is now 5, but was unable to utilize with her second child, Simon. Sabrina sat down with us to share the story of her daughter’s birth. 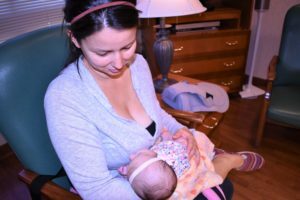 Sabrina woke up the morning of her delivery with contractions but was unsure if what she was experiencing was real labor or not since she had been having intermittent contractions for a few days. After taking her oldest child off to school, she realized her contractions were becoming more regular and told her husband to stay home from work because she felt fairly certain they would be having a baby today. Sabrina got ready to head to the hospital while her husband dropped their 3 year old off at pre-school. Sabrina stayed fairly comfortable on the 45 minute drive to Lincoln Medical Center from Huntsville, AL using an ice pack to help with the pain. Sabrina joked about her travel concerns, “I was worried about having a roadside baby, but I didn’t – which was good!” Upon arrival at LMC around 9:30 am, the staff got the Tavares family registered and into a labor/ delivery/ recovery/ post-partum room. The nurses promptly starting filling the labor pool at Sabrina’s request. While waiting, the staff got the essential oil aromatherapy and music going to set a relaxing atmosphere. Once the temperature in the pool was just right, Sabrina got in to labor around 11 am and stayed there for most of the day. The wireless fetal/maternal monitors were very important to Sabrina, “that was really nice, to not be hooked up to anything, to be free in the pool.” Once she reached around 8 cm dilation and her contractions were stronger and closer together, Sabrina felt like she needed to try some labor positioning and walking. She found the labor ball to be very helpful and she tried using the patient controlled nitrous as well which she found to be “almost too relaxing”. Certified Nurse Midwife Sherri Franklin was there during the labor. Sabrina recalls the assistance she provided during her labor, “Sherri was very helpful in suggesting different methods for coping with the labor pains that I would not have thought of on my own. Midwives are able to give you more one-on-one time during labor than an OB/GYN and it really does make a big difference with them being able to help you with things that you just wouldn’t be able to think about yourself. ” Dr. Emily Evitt and midwife Sherri Franklin were both present for Baby Alice’s safe arrival at 5:17 pm.